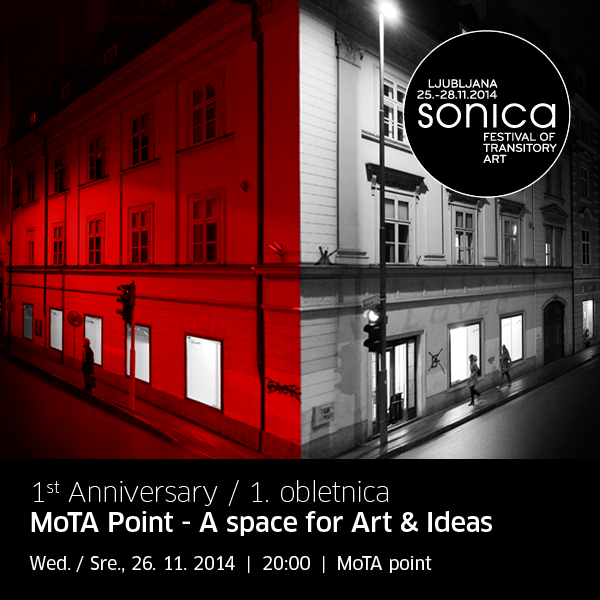 This year’s Sonica festival takes place along with the first anniversary of MoTA Point and is again focusing on diverse artistic practices which all involve transitoriness in the medium of image, sound, object, space and concept. The main theme of the festival is the thin line of playing with perception which is understood as transitory, in constant change, be it the point of view, the point of listening, contemplating an object or transgressing it. Perception is not only a little bit overused field in art but also – in the extreme omnipresence of media in the nowadays society – amongst all a political concept. Gabey Tjon A Tham - Red Horizon. Image courtesy of MoTA Museum of Transitory Art. Used here by kind permission. All rights reserved. The artists of this year’s Sonica are not explicitly addressing the political context in their artworks. They use different artistic forms and aesthetic approaches to address the question of perception at the very point where it is most exploited, in the usage of the term, in the field of popular culture. This field is nowadays interfered by the digital, multimedia culture. 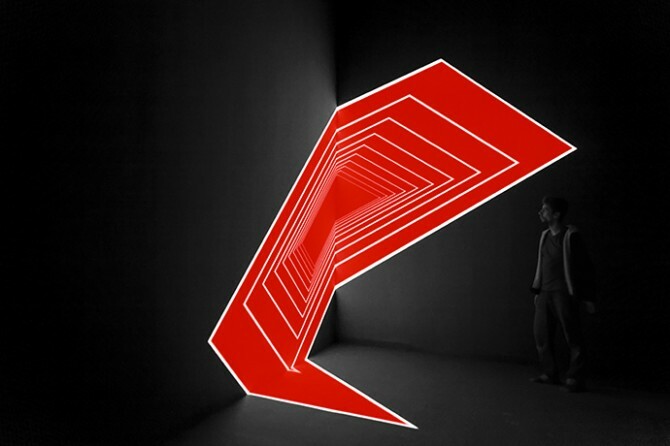 Olivier Ratsi, a member of the famous Antivj collective, presents himself with the AV installation Delta, which reconstitutes the symbol from different aspect and position of the viewer. Saša Spačal, Mirjan Švagelj and Anil Podgornik, on the other hand, use this point of view in order to sprinkle and multiply it in their installation Mycophone Unison. Vesna Krebs presents the micro and macro level of the involved piece Microscope to question the processes of manipulation of information, images and the question of authorship. Canadian sound artist Jamie Drouin uses minimalist halts in the noise in his piece Gradient 2 and therefore transfers the points of listening and sound. Martin Messier uses 8 mm projectors in his piece Projectors and creates loud performative sculptures; in doing so, he changes and transfers their basic technological functions in the void between the sound, the picture and the stage. Austrian-American trio Innode uses the microscopic optic of division of rhythm between digital and acoustic and transfers genre between rock and electronics. 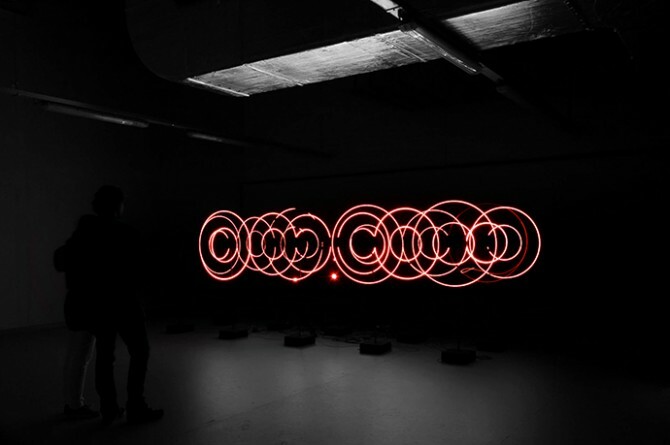 Repeated guest of Sonica, the Dutch artist Gabey Tjon in her sound-light-kinetic installation Red Horizon creates constantly moving patterns of behaviour, which sprinkle through sound. The program of Zavod Sploh, named Zvokotok, brings contemporary content to the classical music and to the heritage of modernism and avant-garde in contemporary classical music (KOMPULZ Esnemble performed by Bruce Hamilton, Luigi Nono, Mauricio Valdes, among others), uses video art, audio-visual performance (Izland in the piece of Matej Bonin), conceptuality (Marko Košnik), innovation in technology for sound reproduction (Miha Ciglar), hacking and DIY electronics (Theremidi Orchestra) and improvisation (Jaka Berger). Tomaž Grom’s Privid, prisluh unveils an installation that acts as audiovisual instrument, creating diffusions between the visual and the sonical, between improvisation and composition. Olivier Ratsi - Delta. Image © Olivier Ratsi. Image courtesy of MoTA Museum of Transitory Art. Used here by kind permission. All rights reserved. MoTA was conceived as a multidisciplinary platform dedicated to the research, production and presentation of Transitory, Experimental and Live Art forms. The organization examines what is the role of the museum today and in the future, transitoriness in space, time and art, or what is the relation between art and life. As a museum without physical space, its programs are realised in different locations and contexts, both in physical and virtual space. MoTA organizes support actions for transitory art in the form of continuous events, exhibitions and educational programs taking place throughout the year in cities across Europe and the world. This initiative was designed as an open and collaborative approach of international curators and artists who bring their valuable contribution to yearly themes. Collaboration defines the artistic production at MoTA. Methodologies aim at overcoming social differences and exclusive modes of working, while most of the artistic and curatorial initiatives deal with themes of contemporary system errors and their consequences (such as virtuality, alienation, loss of identity, hyper-mobility, sexual freedom, media and social violence of all kinds), including strategies to produce ideas, actions and reactions to these errors. Because of the constant search for the new, the uncertain and the undefined, MoTA creates a lively dialogue between artists, curators and theoreticians, on the one hand, and, on the other hand, the public outside of artistic circles and discussion outside auto-reflective philosophies of artworks and concepts inherent to the world of art. MoTA is also the first regular artist-in-residency program in Slovenia, aiming to give a living and working environment to foreign artists in Ljubljana. The residency program is a platform for dialogue and collaborative work where close work with artists, researchers and curators are designed to develop long-term and sustainable collaborations engaging with projects which mobilise art and other communities in order to produce new thoughts, actions and directions. As a member of the ICAS network, MoTA contributes to the crafting of special events with strong identity rooted in local connections and context. Cultural values evolving around music and sound creation, mixed with different other cultural practices, are valorized within alternative sets of criteria to measure the success of the members’ cultural endeavours, favoring quality, critical reflection, innovation and exchange over profit. Reflecting on the aesthetic and societal agency of contemporary sound creation against a backdrop of the transformation processes induced by digital technologies, ICAS members wish to raise awareness and support for experimental and experiential sound and music cultures. They understand their curatorial and organizational activities as a creative force that, engaged in a constant dialogue with artists, producers, critics and audience, constructively contributes to the development of artistically independent music and sound creation. Through various transdisciplinary approaches, ICAS member organizations actively engage in building bridges between art disciplines, cultural fields, scenes and genres with a special eye on fostering exchange between academic musical traditions, experimental music and pop (sub-)cultures, as well as between arts and technology. Designed as an open structure that welcomes the participation of new members, the ICAS network aims to spark dialogue, knowledge exchange and mutual support amongst international organizations engaged with experimental sound cultures. It is a creative platform acting on a global level that supports its members in building-up sustainable infrastructures to support, promote and sponsor experimental and critical sound cultures within their specific localities and contexts. Like all ICAS members, MoTA was designed to accommodate a number of cultural activities, including concerts, performances, commissioned work, exhibitions, participatory projects, educational workshops, conferences, presentations, discussions, publications and informal spaces for knowledge-sharing within and between fields. Martin Messier - Projectors. Image courtesy of MoTA Museum of Transitory Art. Used here by kind permission. All rights reserved. Vesna Krebs - Microscope. Image courtesy of MoTA Museum of Transitory Art. Used here by kind permission. All rights reserved. This year’s anniversary will bring together the works of an important number of artists. The works of French visual artist Olivier Ratsi, the co-founder of the Antivj visual label, are mainly based on representations of space perception and the experience of reality. Over the years, Ratsi has developed a creative process inspired by the deconstruction of space and time. In his work, deconstruction or fragmentation act as an emotional trigger which does not aim to show what things could be, but rather to question their very references. Interested in generating a break from the meaning of the original items and proposing a new viewpoint by providing the public with a new field of experience and a different way of looking at space and time. At Sonica, Ratsi will present Delta, the second stage in Ratsi’s Echolyse project; Delta is a site specific installation that explores the possibility of a fictional three-dimensional space seen through a dematerialised door. Inspired by the fourth letter of the Greek alphabet, which has been represented by a triangle pointing upwards and has originated from the equivalent letter of the Phoenician alphabet, based on a hieroglyph initially representing a door, Ratsi makes use of the anamorposis technique. The piece is based on the position of the spectator, predetermined by the artist, from which the audience will be able to visually reconstitute the geometrical symbol and discover the “pelures” (peelings) emitting from the very center of its gravity point. A long time MoTA collaborator, Dutch artist Gabey Tjon A Tham builds installations by means of a variety of media and art forms. Over the years, her work developed from two-dimensionality towards interdisciplinary approaches. Focusing her work on the potential of sound and site specific installations to engage the audience with a given space, Tjon re-contextualizes excerpts from reality that acquire their form within an architectural space. The perceiver is reverted to a process of reflection on its own thoughts, memories and dreams, while the elements of the piece develop new relations to each other and their surroundings within a spaceless and timeless sanctuary. Having previously exhibited her works internationally at TodaysArt (Den Haag), Sonica (Ljubljana), and Mapping Festival (Genève), Tjon returns to Sonica after her very successful exhibition ((( Repetition At My Distance in 2012. A close collaboration with software artist Marcus Graf, co-produced by TodaysArt and MoTA Museum of Transitory Art with the support of Stroom Den Haag, Red Horizon is a kinetic light and sound installation that consists of double pendulums that form a plane of white particles in a three dimensional space. Each arm of the pendulum contains a white light and a small speaker that moves along the unpredictability of the mechanism to create both order and chaos. The starting point for Red Horizon is the emergence of complex behavior – a phenomenon that occurs, for example, in a swarm of individuals which, through simple rules, display complex behavior, patterns and intelligence as a whole. The installation lingers between the natural and the mechanical, creating entities that give a feeling of an eerie, unknown, living and breathing presence. Light, sound and movement guide their presence as music with physical dimensions, becoming an abstract automatic ballet. Berlin-based artist Jamie Drouin explores the materiality of sound – unique perceptual and sculptural sonic experiences using simple, formalist procedures. By applying several systems of change to a basic sound, such as white noise static or sine wave, his works highlight the perceptual subtleties possible within these common materials. Reducing sound to its component parts, each of Drouin’s projects examine a particular type of acoustic phenomenon. This procedure-driven process allows the subject matter to bring forth its own forms, and opens the potential for listeners to have a revealing perceptual experience and to understand the elemnts creating it. These works are positioned within a visual art rather than a musical framework: they exist in space, albeit temporarily, as shifting sculptural forms, and explore the potential of a purely sonic experience. At Sonica, Drouin will feature a minimalist sound installation focusing on the extreme subtleties of auditory perception, titled Gradient. The speakers emit a simple white noise static, along with a filter, which systematically opens up to reveal lower frequencies over the first 20 minutes, and then switches roles to slowly remove higher frequencies over the second half. With this formal system, the white noise takes on various perceptual shifts and spatial associations through a gradual process of sonic addition and substraction. Saša Spačal, Mirjan Švagelj, Anil Podgornik - Mycophone Unison. Image courtesy of MoTA Museum of Transitory Art. Used here by kind permission. All rights reserved. The Zvokotok series is dedicated to contemporary classical music. Its main purpose is to create links between spaces of common institutional approach to music making and art, on the one hand, and, on the other, between spaces of dynamic activities of non-governmental organisations. A space of dialogue can thus be established to overcome the usual divisions between different artistic activities and production processes. At Sonica, Tomaž Grom’s installation Privid, prisluh will be on display during the whole day. Other events include a round table presenting Ensemble KOMPULZ, its members and the whole project, moderated by Veronika Brvar; a mastercalss with Bruce Hamilton, Mauricio Valdes and Matej Bonin; a lecture with programatic-sound ergonomic examples by Marko Košnik titled Après MIDI; a concert by Theremidi Orchestra & Jaka Berger; and Miha Ciglar’s lecture with concert (presentation of directional speakers) Virtual Sources. The program of series Zvokotok is curated by Luka Juhart, Bojana Šaljić Podešva and Nina Prešiček, and includes musicians Simon Klavžar (percussion), Klemen Leben (accordion), Tadej Kenig (clarinet), Oskar Laznik (saxophone), Nina Presicek (piano), plus guests Anja Brezavšček (flute) and Irena Tomazin (voice). This event is produced by Zavod Sploh (for it Špela Trošt) and co-produced by Kino Šiška, MoTA, Inštitut Egon March and IRZU. Martin Messier is a composer, performer and videomaker who is mainly interested in the clash between electroacoustic music and other art forms. It is through the relationship between sound and material (objects or bodies) that Messier’s work takes shape, redefining the frontiers of concrete music by creating sounds with everyday objects such as alarm clocks, pens, self-conceived machines and sewing machines. At the very centre of this dialogue between sounds and objects is the desire to push the everyday imaginary a little further, to magnify these entities by giving them a voice and by reinventing their function. Messier presented his work in various national festivals and events (Mutek, FTA and Mois Multi), as well as in international ones (Transmediale, Sonar, Nemo, Scopitone and TodaysArt), and he has received a distinction at the prestigious Ars Electronica. At Sonica, Messier will present Projectors, a surgical work of art in which the artist orchestrates the engineering, manipulation and distortion of 8mm projectors under the lights of a digital projector. Through a tight stage lighting and the resynthesis of the 8mm projectors’ quasi-mythical roar, the machines come alive outside of the projection room and turn into bizarre and explosive noise mechanisms. All at once offbeat, unfamiliar and marvelously incongruous, this performance leads the public to a timeless universe, somewhere between dialogue, confrontation and technological contrast. 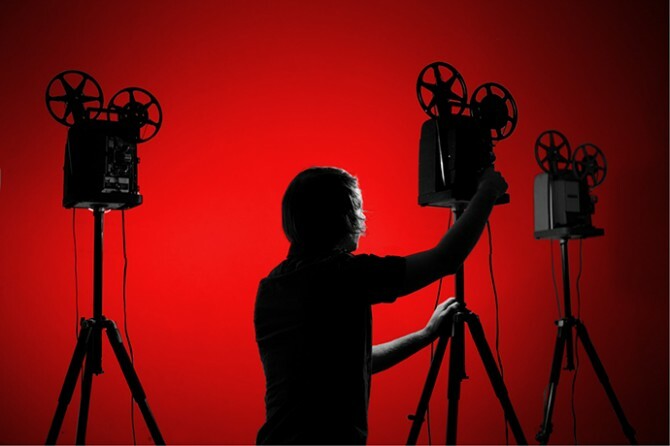 Here, the projectors do not project: they take action and become the performanc eitself – loud and luminous. Vesna Krebs works in the field of interactive installations, Net art and video installation, expressing her ideas and concepts mostly through video and new media practices. Her main work focuses on the relationship between nature, technology and man in the context of visual perception. Whether online or in gallery space, her projects are often set as simulations where the viewer has an important participatory role, and is actively involved in the creation process of the piece. The artist’s current practice focuses on the act of appropriation and collage style, for example in the interweaving of complex system found in nature with digital algorithmic structures of similar complexity. By exposing the identities and similarities of organic and digital inorganic matter, her aim is to escape the illusion that each of us exists in isolation from the technology or from the rest of the world. She constantly challenges the individual mind to put the observed reality into question and her work constantly examines different aspects of perception and reconstruction of the meaning based on art concepts and science theories. 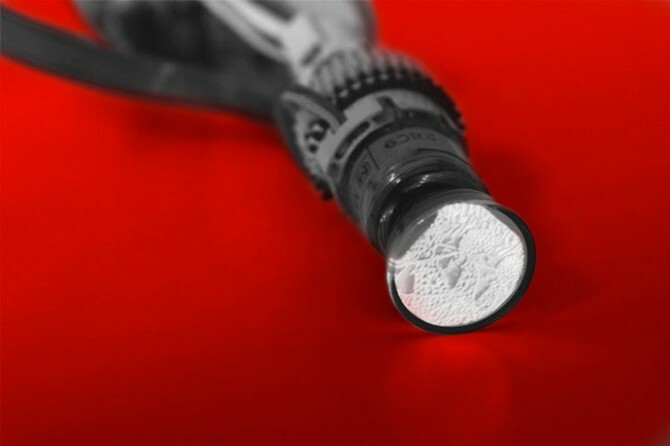 At Sonica, Krebs will present Microscope, an object that is part of the Biotop series, an ongoing investigation on the existence refering to the postmodern debate on the manipulation of information, image manipulation and the question of authorship. This object enables the observation of the virtual organisms; by imitating the focusing and steering of the actual microscope, the viewer can experience the reality of this kind of observation. Zvokotok: Theremidi Orchestra. Image courtesy of MoTA Museum of Transitory Art. Used here by kind permission. All rights reserved. Saša Spačal, Mirjan Švagelj and Anil Podgornik will present Mycophone Unison at Sonica. Their work questions matter as defined by a point of view, raising questions on what happens if the body of the viewer is no longer only one? 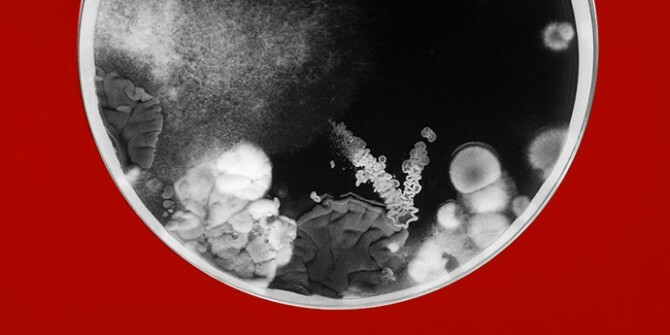 Ecological communities of micro-organisms such as bacteria, fungi and archaea that constitute the microbiome of human bodies indicate the plurality of a human body that can no longer be seen as one but as multiple. Saša Spačal is a media artist based in Ljubljana, Slovenia, who has been working at the intersection of bioart, media art and real-time interactive visualization. Along a series of participations to international festivals and exhibitions such as International Triennial of New Media Art 2014 (Beijing), Haip Festival (Ljubljana), Enter 5: Datapolis (Prague), AmberFest’11: Next Ecology (Istanbul), De:sonanz 2012 (Skopje), Device_art 4.012 (Zagreb), Device_art 4.013 (Prague), Enter 6: Biopolis (Prague), MFRU–KIBLIX 2013: When worlds collide (Maribor), or Sculpture Today: Performative Bodies and Spaces (Celje), the artist has collaborated with various art producers such as Kapelica Gallery, Multimedia Center Kibla and Ljudmila – Art and Science Laboratory to develop media installations and other interfaces by connecting technological and biological organisms. Her work focuses primarily on the posthuman period, when human beings exist and act as one of many elements in the ecosystem and not as sovereigns. The artist has abandoned the Cartesian system of classification to accept the fact that the field of technology has grown and expanded resulting in hybrid phenomena inscribed in mechanical, digital and organic logic. Together with Ida Hiršenfelder, she is developing ČIPke platform, an initiative for researching the conditions of women who are active in the context of science, technology and media art. Since 2012, Spačal has collaborated with Anil Podgornik, a DIY enthusiast interested in electronics, mechanics and physics, and Dr. Mirjan Švagelj, doctor of biomedicine currently working for a biotech research and development company, who has attended several international conferences and workshops in the field of biotechnology, medicine, chemical engineering and has published more than 15 original papers. The result of their collaboration, Mycophone Unison, is based on the idea that the multiplicity of body does not act as one, each biological entity having its own role that is enacted in collaboration with others or on its own. The enactment defines and activates entities needed for completing the act that the environment calls for. As the body emerges in intra-acting with the environment, as it becomes and is perceived as one, its entities are nevertheless multiple and never the same in the next intra-act. The oneness of the body as such emerges only in the specific space-time, where it intra-acts and then dissolves into a multiplicity that awaits its new becoming. The work serves as a navigation tool: a sound map of intra-action between three microbiomes of the bodies of its authors and the viewer. A double-bass player and composer from Slovenia, Tomaž Grom is an improviser dedicated to exploring an extended range of techniques of playing the double bass, including in combination with electronic media. The artist’s creativity is noted for its continuous experimentation with the potential of sound guided by the principle of spontaneity. Having performed in the most varied ensembles of diverse musical genres, making music for a number of theatre, dance and puppet performances, Grom is currently involved in sound installations and hybrid forms mixing installations and concerts. He has collaborated with numerous well-known foreign artists: quartet with Michel Doneda, Jonas Kocher and Tao G. Vrhovec Sambolec, regular duo with Japanese percussionist Seijiro Murayama and has played with renowned international improvisors. 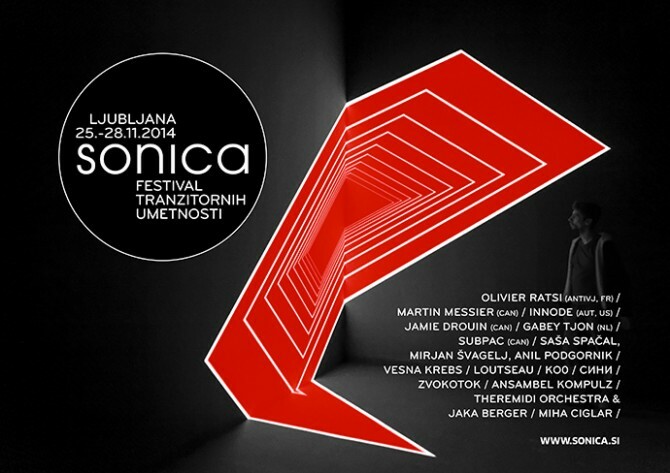 At Sonica, Grom will play Privid, prisluh (Neponovljivo). Neponovljivo (Unrepeatable) is a musical instrument which consists of recorded musical sequences performed by different musicians developing their individual musical language. It is a derivative of a music group which appeared for the first time under the name of “Privid, prisluh” (Audiovisual illusion) and continues to multiply, as the musician can make music by selecting the source, defining volume and randomness, which in turn generate a continuous and unrepeatable composition. This work is a continuously evolving creation, combining original and live music at the intersection of technologically processed contemporary sonority and the elementarity of digitized clean sounds. It is a meeting place of the absent technologically reproduced performers and the immediate presence of the live musician in a concert context. It is also a confrontation space of spontaneous solo performance and subsequent structuring of individual musical presences. Canadian musician Vishal Kassie has recently uprooted to Slovenia to study music production at the SAE Institute. Sub Pac is a patent pending tactile audio technology which transfers low frequencies directly to your body and provides you with a new physical dimension to experience music. As a student of guitar and saxophone, Miha Ciglar graduated from the Austrian IEM in 2009, while establishing himself as a strong author in the field of contemporary composition and the field of electroacoustic and computer music. 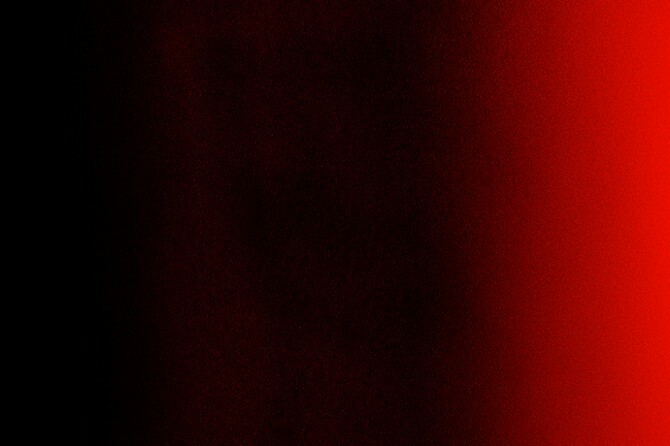 In his work, Ciglar has always knocked against the boundaries of the merely musical and has increasingly appeared in the field of the interdisciplinary, where different expressions of audiovisual installations, interactive dance performances, etc. are traversed. Science, technology and art meet in the artist’s investigations in sound research of feedback and environment creation. 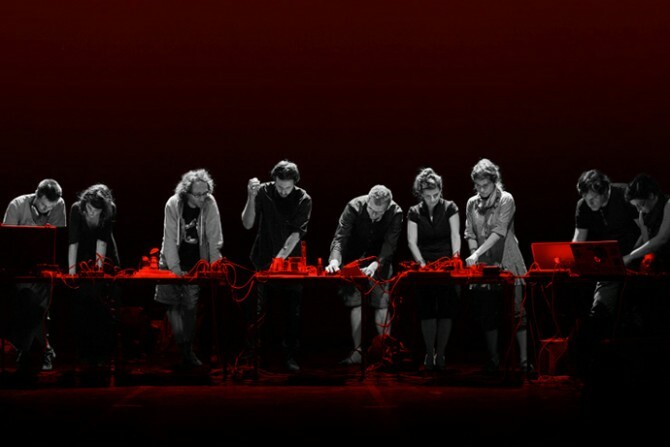 Together with his non-governmental institute IRZU – Institute for Sonic Art Research, Ciglar organizes theoretical reflections, workshops, discussions, lectures, and round tables, while also being involved in the festival Earzoom, which is becoming the central festival of sound art in Slovenia. Virtual Sources is a musical composition Miha Ciglar will be performing at Sonica that deals with the use of unidirectional sound in live performance. Directional speakers radiate a beam of sound in one direction only. The speakers are used indirectly so the sound is heard only through reflections – by letting the sound bounce off walls, ceiling or any other surfaces before it is heard. When the sound is projected through dynamic or moving speakers with focus, some very unusual acoustic effects are created. The reflections of dynamic sound beams seem to be the virtual source of sound moving all over the walls and ceiling. Directional sound, within the context of electro-acoustic composition, enables the exploration of new spatial-acoustic dimensions and the creation of dynamic and virtual fields of sound. Antonio Križnič is an electronic music composer, performer and educator. He has been involved in computer music since the late nineties and has experimented with sound in various forms. As an intensive Ableton Live user for more than a decade, he focuses on sharing his extensive knowledge and experiences with music artists and other like-minded people who are curious about innovative music concepts. An Ableton Certified Trainer, Križnič coordinates and teaches Ableton Live course on SAE Institute Ljubljana. The workshop he will conduct at Sonica takes a close look at how Ableton Live can bridge the gap between studio and stage with an intuitive workflow that allows the user to do everything in real time. Participants to the workshop will understand how time-stretching, arranging and sequencing capabilities allow to quickly create and capture music ideas, turning them into finished productions. Jamie Drouin - Gradient. Image courtesy of MoTA Museum of Transitory Art. Used here by kind permission. All rights reserved. This material has been compiled by Sabin Bors, the curator and editor of the anti-utopias contemporary art platform, from a series of promotional materials provided by MoTA Museum of Transitory Art, including private discussions between Sabin Bors, Martin Bricelj Baraga and Luka Zagoričnik. This year’s Sonica festival is again focusing on diverse artistic practices which all involve transitoryness in the medium of image, sound, object, space and concept. The main theme of the festival is the thin line of playing with perception which is understood as transitory, in constant change, be it the point of view, the point of listening, contemplating an object or transgressing it. Perception is not only a little bit overused field in art but also – in the extreme omnipresence of media in the nowadays society – amongst all a political concept. In 2010 Sonica researched the individual, space and time through a perspective of real/virtual/symbolic and metaphoric online and offline world. In 2011 it transfered these experiences to the field of glocal participation. As MoTA program connected with near and far East and Asia in 2010 already, it engaged in a continuous research, comparison and critical reading of transitions. With Sonica 2011 the organizers researched how artists of different backgrounds engage in topics of transition and transitoriness as something constantly changing, as the era of transition leads to a fast, often one-sided technological development, mostly at the expense of big corporation break-throughs. Capitalist-democratic categories which were to represent a final stadium of a certain developed environment, have in post-transition societies proved to be neo-colonialist with elements of repression and exploitation of people, natural sources etc. An individual is transformed into a contemporary consumer, but also a xenophobe, nationalist or even fascist. In 2011 Sonica researched how artists confront the violence of neoliberal and cultural politics and their consequences. Interest focused on how authoritive positions, forced and particular democracies can be challenged creatively, in negative and positive histories of technological development, in diverse relations between copies and originals, etc.